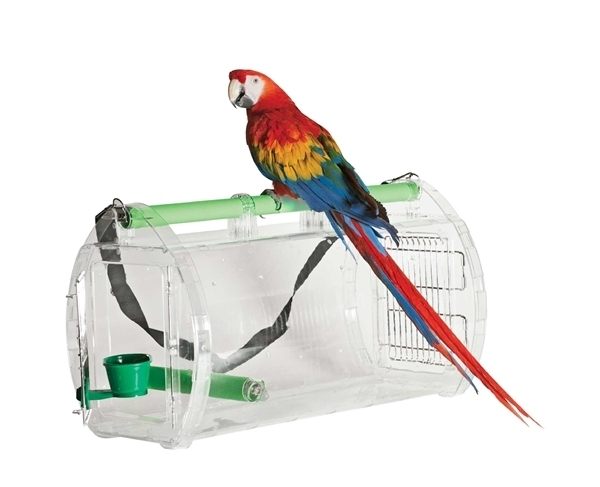 Paradise Bird CarrierTransparent, high impact resistant polycarbonate.This carrier is great for parrots because it gives them a clear view of their surroundings. It also give the owners a peace of mind knowing they can keep a check on their birds during travel. Conures and small birds to African Greys, Amazons, Cockatoos, large Macaws and similar size birds. Adjustable textured perch - 5 locations! INCLUDES FREE DOMESTIC SHIPPING (Continential US only, Excludes Hawaii, Alaska, and PR). Shipping to other areas, please contact us first. Q: Will this fit under seats on a plane? A: No, I don't believe so. From what I can see, the size for under seats is maximum of 19"x13"x9"
Q: The perch and go carrier.We have a red fronted mc caw. Does this have two opening to get bird in and out.I see the stainless steel door. To get to the feed bowl at the opposite end, is there an opening? Seems difficult to get bird our without tail injury.